KSCF credit union is a high profile financial institution and therefore highly visible to both the public and spammers. With a computer network supporting 200 email users who were sending over 100,000 messages each month Kennedy Space Center needed an anti spam solution they could depend on. Having a small IT-department makes them an easy target for spammers and phishers. Although budget was limited safeguarding customer information was the top priority and couldn’t be compromised. Spam affects businesses in several ways, as well as having the ability to hurt the reputation of your business you certainly do not want customers receiving junk or malware emails with your company’s name in the sender’s address bar. Spoofing email is very common and easy to do as it exploits a level of trust that the basic email protocols use. It is important for businesses to put safeguards in place, that’s exactly what Kennedy Space Center Credit union did when they implemented SpamTitan. The dangers of phishing attacks in the financial sector are widespread. Financial organizations represent over 20% of phishing targets each year. Although budget was an issue, safeguarding this information is a number 1 priority and cannot be compromised. The dilemma therefore existed to find a low cost solution that doesn’t compromise on security. Needed advanced technology in filtering spam. Double Antivirus protection – Bitdefender and Clam AV. I had SpamTitan up, running, and configured in about 30 minutes’ said Joel. Extensive & customisable reports were a must have and we got that with SpamTitan. 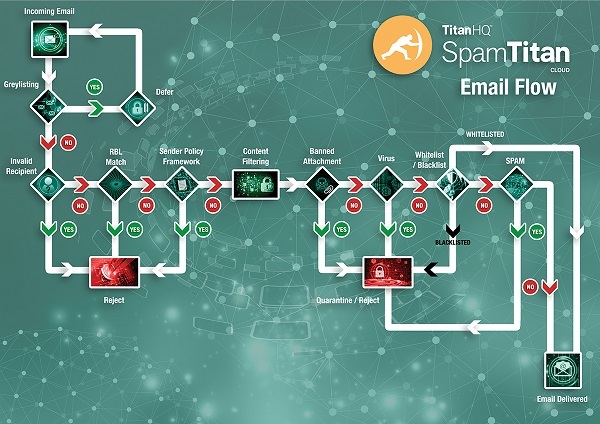 SpamTitan proactively protects the bank against inbound and outbound email threats such as spam, phishing and malware. Kennedy Space Center Credit Union were immediately impressed with SpamTitans blocking abilities. With 1/5 of phishing attacks targeting financial organisations, SpamTitan saved this financial institution time and money as well as safeguarding its confidential customer information. Before SpamTitan every employee spent between 15 – 30 minutes every day deleting spam mail from their inbox, not any more. Zero issues - it was all so easy! How Does SpamTitan Block Email Threats? If you want to improve email security, it is necessary to adopt a defense in depth approach. Layered defenses are essential given the rise in phishing attacks and the speed at which new malware variants are being developed. SpamTitan uses predictive techniques such as heuristics and Bayesian analysis to block new malware threats, spear phishing, and zero-day attacks. 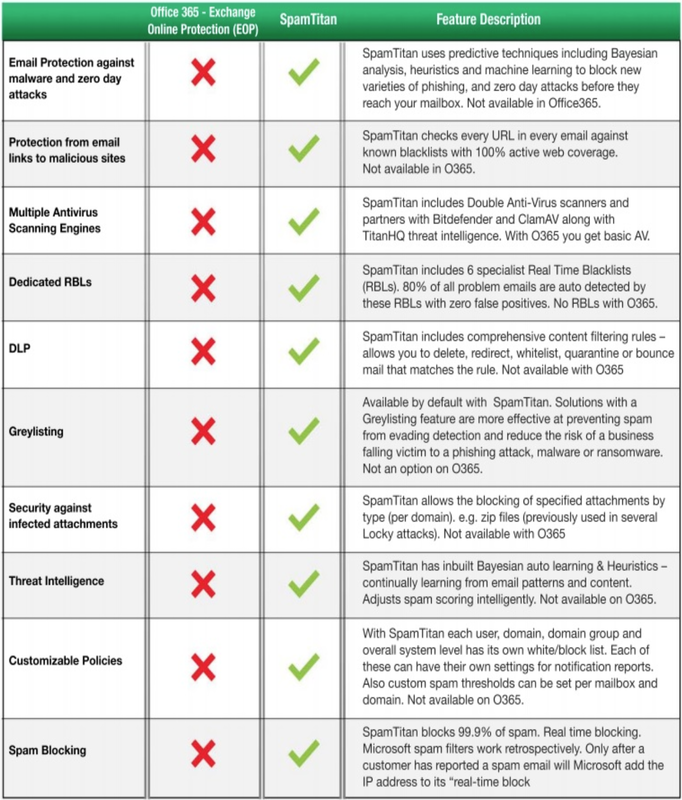 Office 365 incorporates several security features to block spam and malicious messages; however, organizations accustomed to dedicated security solutions are likely to find the Office 365 default security offering falls short of requirements. Listed below are some of the additional features that come with SpamTitan which are not present in Office 365. These features make all the difference and will greatly improve your security posture and make your organization more resilient to phishing attacks and other email-based threats.